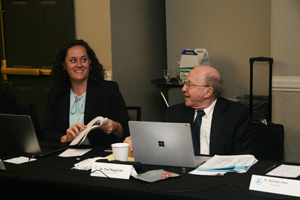 Every so often, our committees review their sections of the P&P, ensuring that our current activities reflect our playbook while allowing each committee member to be cognizant of his or her responsibilities. Over the last few months, our committees have been busy working on these updates. The revisions the committees proposed are reviewed by the Board of Directors and then approved to be updated. I would like to thank the chairs and the committee members for undertaking this process. I would especially like to thank Dr. Gary Sabbadini and his Constitution and Bylaws Committee members who will assemble the revised manual. educational debt. To help, our Board has considered ways to ease our dues in order to promote unencumbered membership into CSPD. These change proposals will be voted on at the CSPD business meeting on April 21, 2018. Please support our new graduates as we welcome them into our CSPD family. recently gave a presentation on how the California State Legislature operates and how the CDA provides dental expertise in the formulation of its legislative bills. 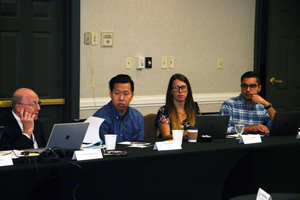 It was illuminating not only for our Board but also for our Santos Cortez Graduate Student Legislative Advocacy intern Dr. Norman Chen and our Warren Brandli interns, Drs. Nicole LaMantia and Shan Girn, who were present. A special thanks goes out to Dr. Nancy Hsieh for organizing this program. Kudos to Dr. Don Schmitt, CSPD Treasurer, the members of the Finance Committee, and Sandy Gore of Smith, Moore & Associates, who underwent a full external audit by Richardson & Company, LLP. Rest assured that all is well with our financial procedures. I also would like to thank the Audit Committee chair, Dr. Eddie So, along with the Audit Committee members, Drs. Natalie Mansour and Kim Whippy, for their assistance. Our next external audit will be in five years. conflicts with other programs. 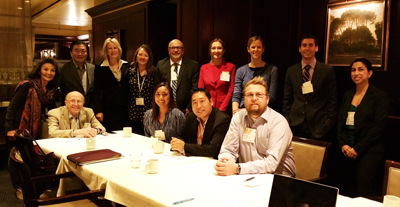 Our HOD meeting attendees are pediatric dental experts who serve as ambassadors of our specialty to the CDA, hailing from local and state level components. We were well represented by Drs. Ryan Abelowitz, Santos Cortez, Rajneesh Dal, Tyler Davis, Randall Heckert, Sahar Jaffrey, Shukan Kanuga, Harvey Lee, Oariona Lowe, Chris Pham, Isabella Piedra, Paul Reggiardo, Robert Ripley, Lindsey Robinson, Arminda Robles, Patrick So, Andy Soderstrom, Kurt Sturz, Anahita Taraporewalla, Sharine Thenard, Kimberly Whippy, and Purvi Zavery. I speak for all the members of CSPD when I say thank you for your service and representation as we work together for the children and the pediatric dentists of California. Thank you all for supporting me in the recent election for the American Academy of Pediatric Dentistry’s Western District Trustee position. I profoundly appreciate your confidence in me. I shall strive to be the conduit of communication between all the Western District chapters and our AAPD mothership.